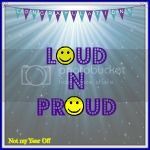 Welcome back to Loud n Proud! Over the last week we’ve had a few very nice days in London. It was all rather hectic given it was half term and I think every single family in a 50 mile radius decided the Science museum would be a splendid visit. Little Z wasn’t bothered one bit by the crowds and enjoyed playing and running about with my friends little one of the same age. It was a brilliant few days jam-packed with lots of visits around the centre and one I really need to write up. One thing I failed to notice completely is how Little Z would look very alert and pipe up in restaurants whenever the waiter came to take our order. “Where are my noodles?” was asked very promptly when presented with his mini starter. He wasn’t interested in tiny little starters. He wanted his big boy noodles! A visit tot he Disney cafe resulted in the same type of thing. Sat up, alert and ready to reel off what he wanted, he placed his order of “Chips and that’s it!”. The waiter chuckled and asked if he’d like anything else. After a second of thought he slowly added “pizza?”. Its not something we’ve noticed but the waiter had him spot on. I looked on a bit in surprise realising this was the first time I’d seen him do this. He was very pleased when presented with his Mickey Mouse shaped pizza and actually even ate most of it. So this week my little proud moment is that we think Little Z has become a pro when ordering food. And maybe a semi pro at eating…some of it! I am your friendly host this week and the rules are very simple. Link up a post that features a little (or indeed, big!) proud moment. Whether it be something your little one has discovered or achieved or something you yourself have done that’s made you a little proud. Then grab the badge and link up to the linky below. The linky will stay open until Sunday so you have plenty of time. Then come back next week when Suzanne from 3 Children and It will be hosting. That is impressive! Neither of my younger two would be brave enough to order food for themselves. I love Z’s confidence and fortrightness. There’s a boy who knows what he wants! Glad you had a good time together last week – big days out for half-term are lovely to do. This reminds me of H. I still laugh at the memory of him on a floating cafe (barge moored on the canal) and asking for a beer. Don’t know what the waiter thought.